Reposted from Henry Porter in the Guardian. This article confirms for me a belief I have long held … that we are sleepwalking into a police state. There are two striking images of modern Britain in this week’s news. The first is the story that crime in Britain is at a 32-year low, which confirms evidence in statistical trends that, like most western countries, we are becoming a more orderly and law-abiding society. The second is provided by the police, which, while suffering a thoroughly deserved collapse in their own reputation, seeks to draw a picture of chaos and misrule that demands ever harsher and more invasive policing techniques. Five years after the financial crash, the police are making the case for deploying water cannon to deal with expected “austerity riots”, when it is blindingly obvious that Britain has passed through a very difficult period without widespread disorder (the riots that began in Tottenham two years ago were mostly a failure of policing, not a response to economic conditions) and, moreover, the economy and employment have both picked up. 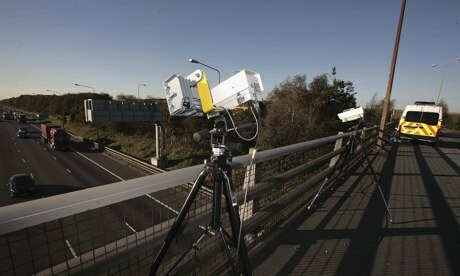 But the far more worrying development is the unscrutinised rollout of the police automated numberplate recognition system (ANPR) for tracking vehicles, which, according to Nick Hopkins’ report, currently stores 17bn images in its archive and is set to increase its capacity by 2018 to read and store 50-75 million separate vehicle sightings a day. This is a very powerful surveillance system and the important thing to remember is that the decision to cover Britain’s motorways and town centres with cameras that track the movements of innocent citizens is that it was never debated by parliament. The system was cooked up between “twinned” committees from the Home Office and the Association of Chief Police Officers, which, incidentally, was a private company and immune from FOI requests, then deployed with constabularies footing the maintenance bill. Not one minute of parliamentary debate preceded the installation of the system; politicians of all parties went along with the police assertion that this was a necessary and proportionate tool of modern policing. And like all new tools given to the police, it has been abused, with officers using the system to track partners, to conduct minute-by-minute surveillance on the movement of legitimate protestors and to meet targets and raise revenue from minor motoring offences. There are urgent questions about links to other databases and which bodies have access to this enormous store of information, but a much greater worry exists about the state’s vast surveillance dragnet, which we know now has access to the movement, communications and personal details of everyone in Britain. Julian Blazeby, the assistant chief constable for Staffordshire and lead on ANPR for the Association of Chief Police Officers (Acpo), attempts to soothe worries about abuse and transparency by saying: “It is always a challenge for us, balancing the rights of individuals with preventing and detecting crime, however we want to be as transparent as possible, and perhaps in the past we have not been as open as we could have been.” But it doesn’t appear that neither Blazeby, nor any other member of Acpo, gives the slightest consideration to the liberty of innocent citizens in an increasingly law-abiding country. The actual trends evident in British society of course have no influence on the sponsors of the great surveillance project, for this is simply a matter of the state and its agencies gaining greater degrees of unfettered control over a free people. It is possible to exaggerate the threat, but we can now legitimately claim that through our communications and movements each one of us has been virtually tagged by the state. A handful of politicians have raised concerns over the years, but the truth is that while taxpayers continue to fork out tens of millions for systems that are utterly out of proportion to the problems the police and intelligence agencies face, the issues about liberty and oversight find no mainstream political expression. The police get what they want, whether it’s water cannon, Taser guns or the extended ANPR system, and that is because we do not remind them that they are our servants, not our masters. We can be sure of one thing – this system will be abused and, in times of political upheaval, we can expect it to be used to defend the state against legitimate political dissent. Imagine its use during the miners’ strike; consider how it is currently used to track climate-change protesters. But the main point is surely the contrast between the increasing orderliness of society and the examples of endemic corruption,destruction of evidence, misuse of firearms, punitive attitudes to innocent members of the public, racism, excessive force, the misuse of undercover policing operations and deaths in custody that litter the record of British police. While we become more law-abiding, police standards decline. Instead of addressing their own problems they create a fantasy world of chaos and lawlessness that requires more and more control and surveillance. Where are the politicians who will guard our liberties and ensure the police meet our standards of lawfulness? This entry was posted in Uncategorized and tagged Acpo, ANPR, austerity, CCTV, civil liberties, crime, Home Office, Police, surveillance, Taser guns. Bookmark the permalink. Reblogged this on Self Reliance.